EasyLanguage documents, such as activity bars, functions, indicators, paint bars, strategies, etc., may be combined into a Project so that they can be opened, closed, imported, exported, and verified together as a group. Whether you need to share, archive, or simply organize your work, EasyLanguage Projects can enhance your development experience. Opening a Project file displays the project panel that lists all of the EasyLanguage documents saved in the project and makes them available as document tabs across the top of the Code Editor window. Projects are accessed using the File > Project menu sequence from TradeStation Development Environment (TDE) . New... - Opens the Save As File dialog box to create a new Project file. Open Project... - Opens the Open File dialog box to open an existing Project file. Close Project... - Closes the current Project file..
After creating or opening a Project, the active Project toolbar (see above) appears on the left side of the TDE . Click (Auto-hide) to pin or unpin the toolbar to a Project tab on the left margin. Once you’re finished, simply select "Close Project" from the Project menu item and the Project, along with any analysis techniques belonging to that Project, will be closed. To reopen a Project, select "Open Project" from the Project menu item, and the Project Toolbar will appear, along with the analysis techniques added to the Project. Project files are XML-based with an .ELX extension and are by default located in the MyWork folder. They store a reference to the analysis techniques they contain, along with any user created notes. The Project toolbar (see above) displays all analysis techniques and dependent files. You can navigate to any file by double-clicking on its name. 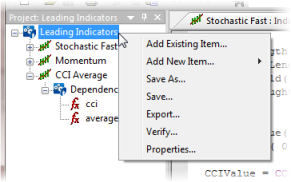 After creating a Project, analysis techniques are added by right-clicking and selecting "Add New Item..." or "Add Existing Item..." (see below). Saving the Project writes the project structure to the .ELX Project file you created (see Managing Project Files). To Export the Project, right-click on the Project name, select the "Export" menu item, and provide a name for the export file. Exporting the project packages the Project file and all analysis techniques in the project to an EasyLanguage Project file having an .ELP extension. The .ELP file is similar to an .ELD file and can be used to back up your work or share it with others. You can also export an a project to an .ELP file using the File >Import and Export menu sequence (see Using the Import/Export Wizard). Click Verify to automatically open and verify all analysis techniques in the Project. Use the Properties menu item to show the location of the Project file and to add a descriptive Note about your the project.